Winners of the Tunnell Trust Awards 2016, Park Lane Group Young Artists 2015/16 and winners of Nonclassical’s Battle of the Bands 2014, The Hermes Experiment is a contemporary quartet made up of harp, clarinet, voice and double bass. Capitalising on their deliberately idiosyncratic combination of instruments, the ensemble regularly commissions new works, as well as creating their own innovative arrangements and venturing into live free improvisation. So far, the ensemble has commissioned 40 composers at various stages of their careers. The ensemble also strives to create a platform for cross-disciplinary collaboration. In June 2015, they created a ‘musical exhibition’ with photographer Thurstan Redding, and in September 2016 during an Aldeburgh Music Residency, they developed a new interpretation of Shakespeare’s The Winter’s Tale with director Nina Brazier, composer Kim Ashton and five actors. 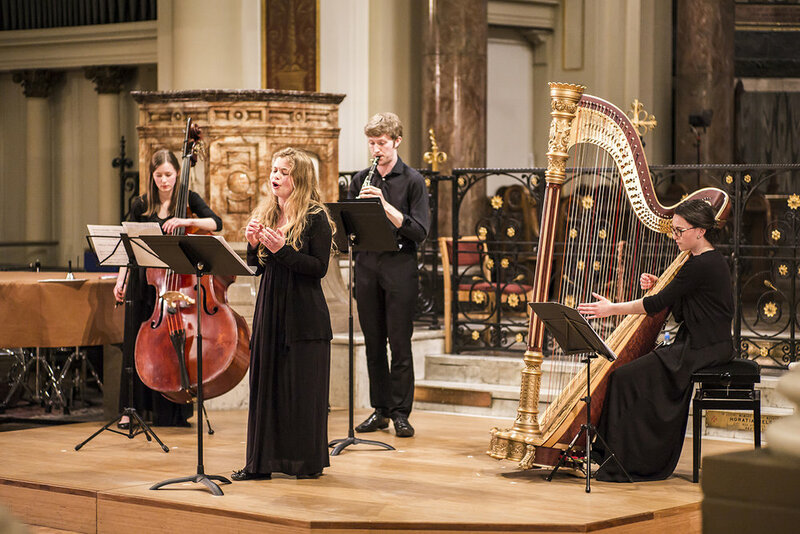 Recent highlights include a showcase performance at Tallinn Music Week 2017 and the ensemble’s debut at London’s Southbank Centre and Kings Place. The Hermes Experiment is generously supported by the Arts Council England, RVW Trust, Hinrichsen Foundation, Britten-Pears Foundation, Future of Russia Foundation, Oleg Prokofiev Trust, Future of Russia Foundation and Nicholas Boas Charitable Trust.